Are you a fan of peanut butter and jam sandwiches? You'll love these little delights! 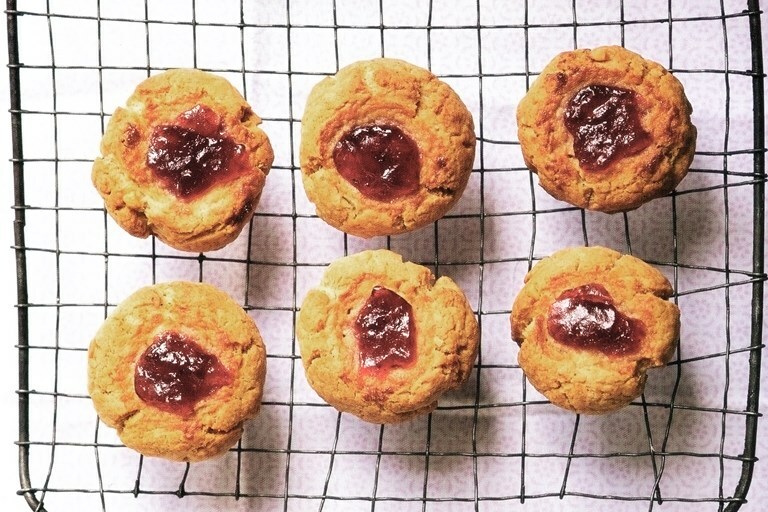 Jack's peanut butter and jam cookies are a real treat afternoon treat. I have brought together two of my favourite cookies into a classic combination of peanut butter and jam. My small boy loves making the thumbprints in these and spooning in the jam, and it's a happy rainy-day activity to do together; although having such tiny little thumbs, he does his with a teaspoon! I like to serve the cookies warm from the oven with a scoop of frozen yoghurt. Try different flavour combinations such as grated white chocolate in place of the peanut butter and lemon curd instead of jam. Or try dark chocolate with blackberry jam for a dark, delicious 'Black Forest gateau' version. Using your thumb, or a teaspoon, make a deep well in the centre of each flattened ball of dough; the cookies will flatten and spread out slightly at they cook, so don't be afraid to dig in!